In/memory of/ARCHIBALD MACDONALD/of Duirinish/born 21st Mat 1868/died 6th November 1962/husband of/CATHERINE GORDON. Remembered with affection/by his grandson/JAMES BRYCE. Picture Added on 06 January 2016. 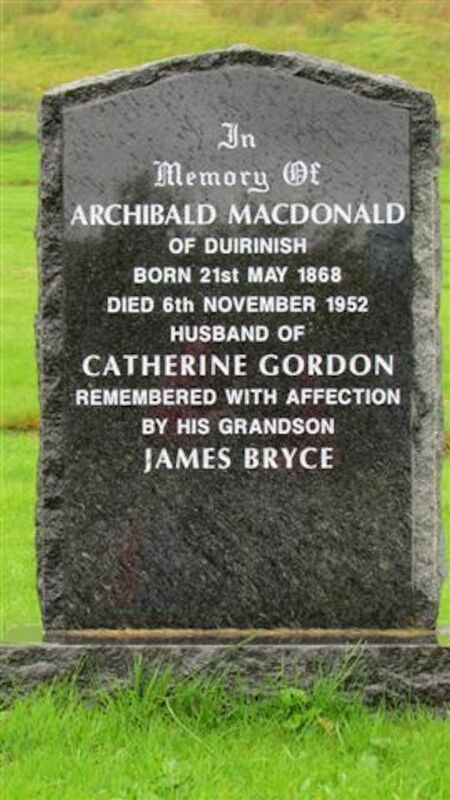 Archibald Macdonald was born at Harlosh, Isle of Skye, he was the 8th child of 12. 1893 at Achtertool Archibald married Catherine Gordon. Added by Flora Macdonald on 07 January 2016.